Mahalo to Eric Arakawa for helping expand my knowledge of surfboard building. On a recent trip back home I had the privilege of watching and learning from one of the best glassers in Hawaii! I also shaped a few boards. Mahalo Derek for letting me use your shaping room! Also Mahalo to Dakine Hawaii for 20 years of support! I am true to this…hand made surfboards from start to finish. 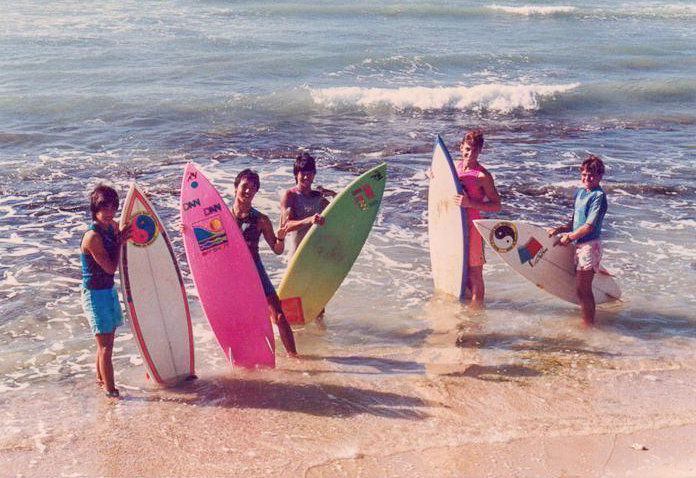 Circa 1987 Nanakuli Tracks, west side of Oahu Hawaii…That’s me in the center with the green board shaped by Dan Nakasone (RIP)…one of Hawaii’s best shapers.